Come rain or shine, 88-year-old Bermudian Johnny Barnes devotes six hours every day to an endearing traffic ritual that has made him one of the island’s most cherished citizens. In time for Valentine’s Day we’ve got a tremendous story of love, just not of a romantic variety. Instead it is the story of Johnny Barnes, who sits in traffic every work day to wish the commuters a good day, and to tell them he loves them. Ordinarily having an aged man sitting in traffic doing eccentric things is a cause for worry, but Mr. Barnes is as sweet and genuine as one would hope he’d be. Through Johnny’s persistence, time has transcended awkwardness, and the film shows how, to the community in Bermuda, Johnny has become an indispensable icon. Shot in the bright Bermuda sunshine, Mr. Happy Man is an endearing and optimistic pick-me-up, a perfect pairing for a case of the Mondays or any form of Valentine distress. What’s fascinating about the film to me is that the narrative arc occurred within myself rather than within the film. Shot and staged amazingly well, with, by and large, engaging performances by his interview subjects, Matt Morris has made a fine short documentary, but the profile’s narrative is rather basic. We are introduced to Johnny, receive some testimonials regarding the love that exists for him in the community and then it ends (somewhat morbidly) on a statue created in his honor. Thus the the real change and transformation of the piece comes from me. As the film begins I’m a Johnny Barnes skeptic. “Whaddya mean he loves everyone? What kind of attention-seeking ploy is this? Doesn’t this just devalue the meaning of love?”. Of course there is a self-interest to Johnny Barnes, his ritual makes him feel-good! And as the film shows, it has also made him relevant, providing a meaning and structure to his days and life that I’m sure many other 88 year-olds could envy. 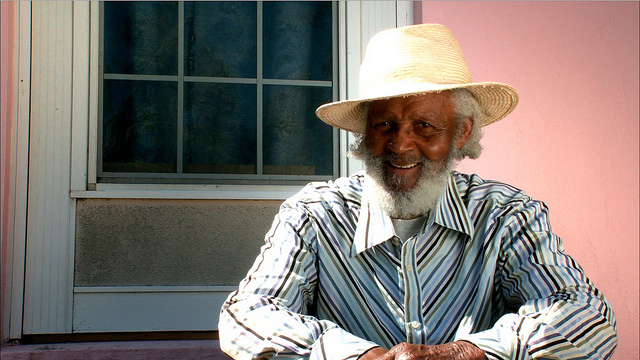 So much good seems to have come from Johnny Barnes’ unique and daily act of expression, that through the sheer relentless of optimism and good-feeling this film exudes, my cynicism fades, until I feel like I genuinely care about Johnny and his well-being like everyone else in Bermuda. Director Matt Morris first came on my radar through his wonderful short doc Pickin’ & Trimmin’, and I was happy to catch Mr. Happy Man alongside great work by SotW Award Winner Sean Dunne at DocNYC in November. He also has recently become an online short film evangelist, writing a great piece on Ted Hope’s Blog last month describing the process by which he made Pickin’ an online success. Best of luck to this newest short film of his which premieres today. Help him by sharing the link with someone you love, which, if we emulate Mr. Barnes, is everyone!